I try to keep my expectations low when it comes to watching movies. These days, too many things are built for test audiences and foreign markets. But every year, I can always count on at least one movie fully capturing my attention and instilling a need for me to watch it over and over and over again. Last year, The Fault in Our Stars introduced me to author John Green. The movie floored me and I’m still a bit perturbed that I didn’t buy stock in Kleenex following the press screening. 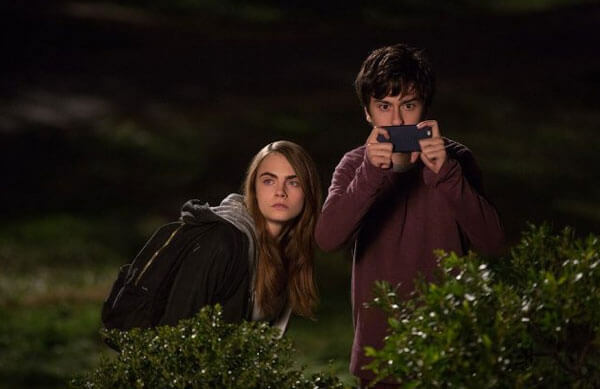 So with his next book-turned-movie, Paper Towns, I was less than cautiously optimistic that the experience would be exactly what I want in a film. In its favor, aside from Green’s source material which I will be reading very shortly, actor Nat Wolff steps up to a lead role (after playing a supporting role in The Fault in Our Stars), and screenwriters Scott Neustadter and Michael H. Weber return to adapt Green’s text. Honestly, to some degree, it’s their involvement that buoyed my expectations more than anything, as they also adapted The Spectacular Now and wrote (500) Days of Summer. Hopefully you’ve seen all of those movies and can now appreciate why I had Paper Towns on my radar. Thankfully, director Jake Schreier and everyone else involved managed to meet those lofty expectations and if you’re wondering why I’m not returning your calls this weekend, I’m probably re-watching Paper Towns. Now, don’t worry if you think I’ve picked yet another fully melancholy affair and have dropped my life savings into Kleenex stock this time around. The Fault in Our Stars is a full-on tear jerker, and still gets me each time I re-watch it. However, while there were moments that could engender some leakage from my eye sockets with Paper Towns, it’s much more of a reflective and nostalgic affair. Quentin (Wolff) has been infatuated/”in-love” with Margo (Cara Delevingne) since he first laid eyes on her as a kid when she moved in across the street. As life would have it, their social circles diverged soon after hormones entered the picture but Quentin’s pining never waned. Out of the blue, Margo enlists Quentin’s help with a teenage revenge plot. This sets in a motion the final weeks of high school for Quentin, Margo, and all of their friends; complete with parties, prom, and a road trip. What this movie does so well, and that credit goes to Green, Neustadter, and Weber, is capture the voice of 18 year-old kids. Much like the other films I’ve mentioned in this review, the ability to present young adults in a much more realistic and sincere manner is in what I might call a Golden Age (especially when you throw The Perks of Being a Wallflower in the mix). Sure, many of us consider John Hughes’ films that kind of touchstone, and the YA novels are … well, they’re really just a romanticized version of what it’s like to be young … but there is so much good material being brought to theaters these days that it’s making my home movie rotations much harder to decide upon. I will say that the specific events in Paper Towns are idealized and you could definitely make the case that things happen in an all too convenient manner. I’m also interested to find out upon reading the book if Delevingne’s portrayal of Margo is true to the book or if she was missing just the tiniest bit of softness around the edges as it felt at times. However, while I was fully cognizant of all this while watching the movie, I also was flooded with my own experiences from high school and early college that were similar in tone and experience. Hopefully, we’ve all taken a spontaneous road trip with friends across state lines. Hopefully, we all had an amazing Prom. Hopefully, we’ve all placed our hearts in the hands of someone else. Hopefully, we’ve all had crystallizing moments with close friends. And hopefully, we’re aware of how all of these things have shaped us into who we are today. That’s what Paper Towns is trying to convey and where I think it succeeds. My only concern is that I’ve talked this movie up so much that you go into it with inflated expectations. If you’ve read my reviews all these years, I hope you know to take all of my exaltations, and some of my rants, with a grain of salt. But if you were at all interested in this movie, please go out and see it. If my review is not enough to get you into a theater, maybe watch the trailer (which tells too much in my opinion but maybe you’re not as perturbed by that phenomena as I am). Either way, I’m now officially on watch for John Green’s next book-turned-movie, Looking for Alaska, which is slated for a 2016 release. I have no idea what it’s about but you can be sure I’ll be seeing it as soon as I can.